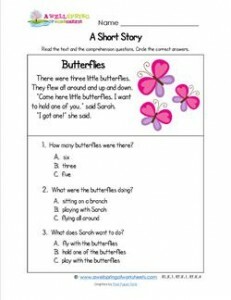 Sarah is the star of the show in this short story for kindergarten. She is trying to catch a butterfly and succeeds! Quotation marks are used in this passage. Sarah talks to the flittering butterflies. This worksheet set has 3 pages, one in color, one in black and white, and an answer sheet.